In 1994, I met a girl at work. Her name was Krystal. We hit it off. Even from the start, we just kind of trusted each other. Isn't that funny when you meet someone like that? Then she moved away and we lost touch until ten years later, when I saw her resume come across my desk. She had no idea I worked for that company. She just blindly sent it into the HR department of my company. I called her and hired her on the spot. We worked together for a year and a half until she moved on to a higher paying job. I have thought of her often and wondered how she and her family were doing. I always meant to look her up on Facebook, but just never remembered once I started browsing and looking at the day’s business. Two days ago, I had lunch with some wonderful women who care for children with diabetes. I really liked the newest member of our Diabetes Mommy Club. I hadn’t met her before. Her son had been diagnosed on the first day of school this year. I was impressed with how she took the bull by the horns, learning everything quickly and helping her son through the emotions of their new life style. During our meeting, she admitted she had cancelled on us twice previously because she was afraid of what she would learn about her new found future. A support group setting is always difficult at first, so we understood. But the group just clicked! She stayed and talked at Panera for almost four hours! It was great. Even though some of the things we talked about were hard to hear, she said she was so glad she came. She was the kind of person that, again, I instantly trusted. Afterwards, she sent me a message on Facebook to thank me for talking with her. Bummer because she beat me to sending her the same one first. It made me smile. Helping people who are newly-diagnosed is my favorite part of dealing with diabetes. It is a hard life, but it is manageable. 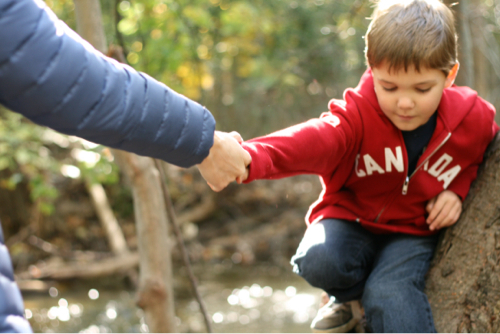 When your child is newly-diagnosed, there are a lot of variables. The scariness of the unknown is the worst part. 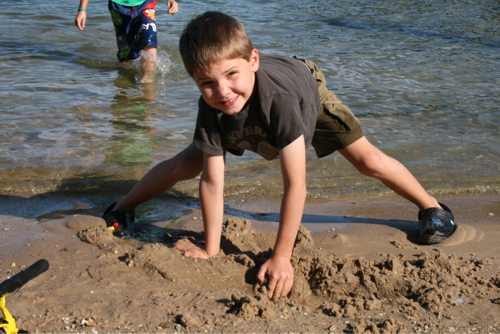 For a year, you just wait to make a simple mistake that can seriously harm your child. This responsibility can be overwhelming. Later that day, she called me. When a diabetes mommy calls, no matter what time it is, you pick up! Sometimes those calls are super urgent and a mom needs help right away. She said, "Shari, you are never going to believe..." I cut her off and said, "Don't even tell me you are Krystal's sister!" She just started laughing and said, "Yep!" Goosebumps! The entire time we were at Panera, I kept noticing that she reminded me of someone. At one point, I thought about Krystal, but I never asked her if she was related. The only way she made the connection was that Krystal saw her Facebook message to me and called her right away to explain the connection! I love the way the universe works. I love the amazing stories that come from the six degrees of separation! I am fascinated by the connection among people. I love Facebook! I think Facebook should do commercials about the crazy connections that have been made. My cousin works for them. I will tell her the idea this weekend when I see her at a holiday party. So, after I hung up, I wondered what could be the purpose of us meeting. Sure, the power of two moms going through the same thing is amazing, but I knew it was something deeper. I promised myself to look for the reason as our friendship grows. I have to give myself pokes with a needle to get blood that goes into a machine. the machine to show me this number. I have to do this at least four times a day. is not fun, it is actually very scary, but it is also magical because it keeps me alive. I will have to do this for the rest of my life. This is my Magic of a Moment story. Something tells me that one day I will be helping Thomas publish his first book! His coming into my life sure is the Magic of a Moment for me! What an amazing way to look at it. What an amazing and mature way to present his stored-up feelings. What bravery to handle all of this and write it down so clearly and poignantly. 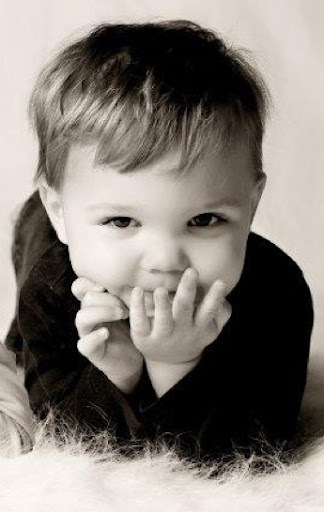 I have never met Thomas but I am already loving this little boy! Thank you to the kismet energy of the universe for letting all of the above happen just so Thomas could share his story with the world. 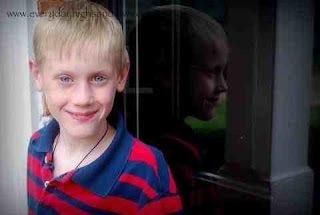 Thank you Thomas for letting us see diabetes through your eyes. Diabetes is hard, but you can do it! Keep writing down your feelings about it, even if just for yourself. One day, you will amaze yourself! I promise! I can't wait to give Krystal a call! This is Thomas on his first day at school. A couple of hours later, he would be rushed to the hospital with a blood sugar of 700. A child without diabetes has a blood sugar between 70-100. This is him today! Blood sugar 95! Thank you insulin. So this marks the end of 30 days of posting! I hope everyone can see that Rocco can play, volunteer, make videos, eat ice cream, give back and write books, all because he is able! He just needs to stop and check his blood sugar once in a while. December should be filled with fun posts about getting ready for the holiday season, twin stuff and maybe some snow (?) pictures! Thank you again for voting for the contest! 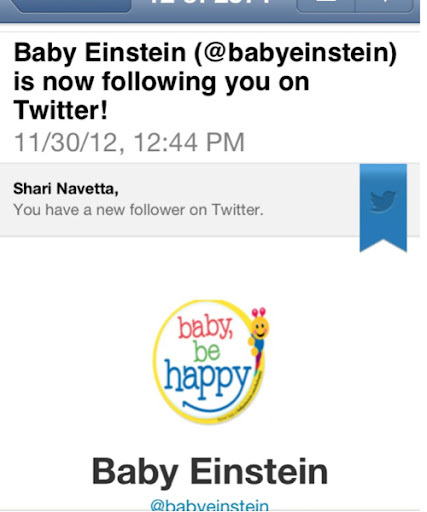 Because of you today Baby Einstein is now following us on Twitter and I didn't even ask them first! Yay! This was funny to me because when the boys were 9 -18 months Baby Einstein videos were the only way I was able to get a shower! It felt like I had come full circle! Lol! Ok, so we didn't come in 1st place. No worries. 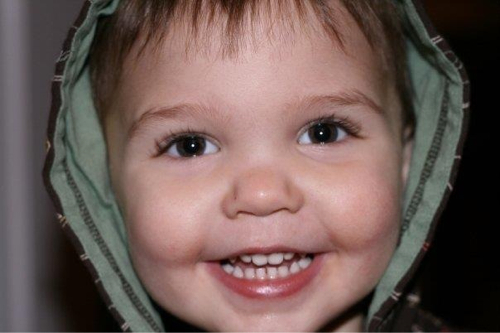 We just had to make it to the Top 25 to be featured on www.circleofmoms.com!! Thank you to everyone who took time and energy out of their days to help me get to the top! I really appreciate you sharing the link and being so invested with me! I hope you had as much fun with the "everyday highs and lows" of it as I did! It was a nail-biter to the bitter end. I wanted to share with you all of the great things that have happened because you voted! Because of you, I gained 45 more likes on the Everyday Highs and Lows Facebook page! Now these folks will be notified in Facebook whenever there is a new post. If you would like to be notified too and have not yet "liked" our page on Facebook. Please, click here. Because of you our blog gets featured on the Circle of Moms website! They have a readership of over 6,000,000 moms! Because of you, I received 25 new comments. Comments fill my bucket! It makes me feel loved and heard! Because of you, I get to put this super cool looking badge on my blog. It is like "street cred" in the blogger world. Because of you, I got a job as a freelance writer with a local newspaper! This is truly a dream come true! Because of you, 3,500 more people have read Everyday Highs and Lows. It's a whole new group of people that I would have never reached! Because of you, people in over 42 countries are also reading Everyday Highs and Lows! Because of you, I may get to write for the Circle of Moms! I will let you know if that happens. Because of you, and this is the most important one, over 6,000,000 moms will now have access to the symptoms of Type 1 and Type 2 diabetes. Because of you, a life will be saved. So you see, because of you, I did win. 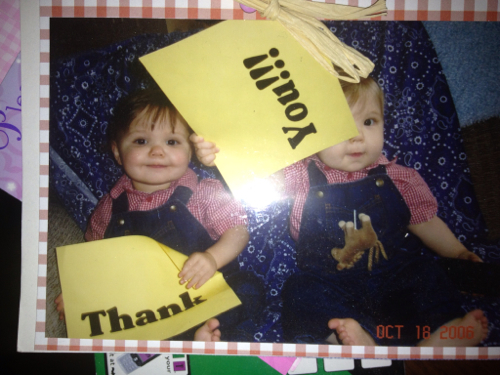 This was their thank you card for their first birthday! I love the toes! Haha! Here is the official letter from Circle of Moms. 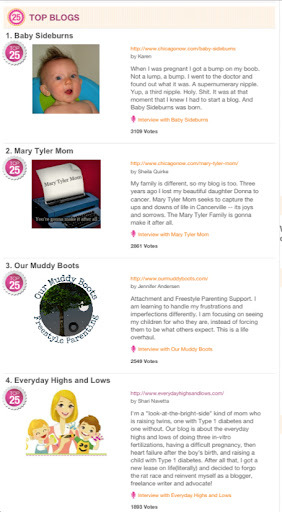 Congratulations on having your blog voted into the Circle of Moms Top 25 Family Blogs by Moms - 2012! 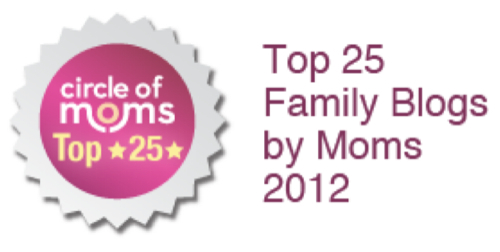 We look forward to showcasing your blog in our Top 25 Family Blogs by Moms - 2012 official Top 25 list, which will be promoted on Circle of Moms next month. To help us best promote your voice and writing, we'd love to include an interview, photo, link to your blog, and a few of your favorite blog posts. We're also excited to share with you your Top 25 badge! You can copy and paste the code below to add your badge to your blog. The badge is also available when logged into your Circle of Moms blogger profile. Congratulations again on making it to our Top 25! We look forward to giving you the spotlight on Circle of Moms. Today, I spent the day with three, wonderful women. All three had children with Type 1 diabetes. The first woman's daughter has had diabetes for 6 years. The second woman's daughter has had it for a little over a year. The third lady's son has had it for three months. It was so nice to speak openly about the responsibility level of taking care of child with a life threatening disease. As "D-moms", we try to down-play the level of intensity to our children, friends and even our family members but together we can let our guard down and compare notes, share, plan and help one another. These friendships are priceless and sacred to me. Thanks ladies for helping me today. 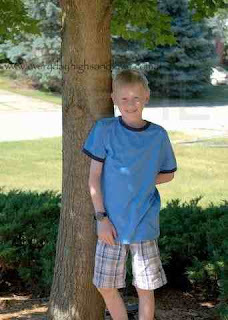 The woman who's son was just recently diagnosed, said she diagnosed his diabetes because of reading a blog. It was a funny mom blog where the mom had a daughter with diabetes. She said the woman casually mentioned her daughter's diabetes in certain posts and she remembered the symptoms. That inspired me to put this post out tonight. If not caught, Type 1 diabetes can lead to seizure, coma or death. If I can save at least one life, then my life will be complete. Please, remember a couple of things. 1) These are symptoms, if you suspect them please go see your doctor right away. Type 1 diabetes doesn't wait for a good day. It is an emergent situation. 2) If anyone you love doesn't have these symptoms, please keep them in the back of your mind. If you know the symptoms, you may catch it early for a loved one. 3) Adults can get Type 1 also. Weight loss, going to the bathroom a lot and extreme thirst are two major clues. Plus all the others listed below. Here are the symptoms of Type 1 diabetes from JDRF. November is National Diabetes Awareness MonthKnowing the warning signs for type 1 diabetes (T1D) could save a life. If you or someone you love exhibits one or more of these symptoms, call a doctor immediately. Education about the symptoms of T1D is critical because type 1 can easily be mistaken for more common illnesses, such as the flu. JDRF has literature which lists the symptoms and treatments of type 1 diabetes and hypoglycemia (low blood sugar)--available for download here. Each year, more than 30,000 Americans are diagnosed with T1D; 15,000 adults and 15,000 children. That's about 80 people each and every day.Misdiagnosis can have tragic consequences, including death. Knowing the warning signs of T1D can save a life. Please share what you've learned with everyone--family, friends, teachers, doctors. Until a cure is found, the more who know, the more lives will be saved. Please, help JDRF raise awareness about the warning signs of T1D--a chronic, debilitating autoimmune disease that is most often diagnosed before the age of 30. As with many diseases, early diagnosis goes a long way toward preventing serious health problems, and even death. Tomorrow is the last day to vote for the contest! Thank you for all your help! It was quite a ride! I already feel like I won because of friends like you! As you may gather from a month's worth of posts, diabetes can take over a household. With the hour-by-hour care and the daily monitoring, it just kind of weaves itself into the fabric of the family. Kind of like brushing your teeth. I have learned to live with it. I am hoping to make it as seamless as possible for Rocco because even after I am gone, he will still have Type 1 diabetes, at least for now. If I can present it as a necessary routine throughout his childhood, I hope I am training him to think of it this way as he becomes an adult. I spend my days working with him so that in adulthood his life with Type 1 diabetes will just be a natural part of his routine. If I fight it, he will too. If I hate it, he will too. So, I try to remain diligent and optimistic, even on the toughest days. However, the part about diabetes that shakes me to my core is not actually about Rocco or even my own feelings about it. It is about Zeke. My precious Zeke. Zeke is simple. He is easy. He is brave. He is the kind of kid that just goes with the flow. He has about five things that he really cares about (activities and various toy things) and the rest is just static to him. His greatest joy is receiving gifts that relate to his five favorite things. He feels loved when he gets gifts. Maybe their playroom is an outward representation of my “mother's guilt”. The room is packed with many variations of the five things he likes. 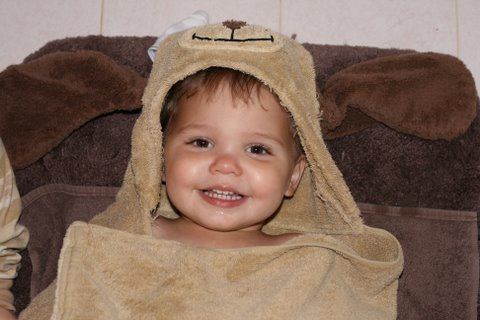 He is a joy to raise and I love him with everything I've got! If I were to really dig deep and pull out the one negative in my life that I am suppressing, it is the guilt I feel for giving more attention to Rocco than I do Zeke. Of course, Zeke's laid back nature and Rocco's immediate medical needs are the reasons for this. But, I know it is still happening and those are just excuses. They are good excuses, but they are still excuses and do no good for Zeke. Zeke deserves better. He does because he just rolls with it. He never complains about how his life has to change when diabetes calls us into action. He never complains when Rocco's blood sugar gets too high or too low and his twin brother yells at him or gets frustrated with him. He somehow understands that it is only the blood sugar talking. Maybe it is a twin thing, but maybe it is because he is just so compassionate. On the weekends, he just runs around town with Michael, Rocco and I even though he would rather leave the crowds behind and stay home to have me read to him. He just goes with it. I usually tell myself that I don't work outside of my home because Rocco needs me at a moment's notice,but maybe that is not the whole truth. Certainly I know that if I had an outside job, Rocco's care, taking care of the household needs and oh yeah, paying attention to my husband, would all suffer. But I also know that if I worked, there would be even less of me for Zeke. I feel that because he has been so amazing in dealing with diabetes, I owe him. As much of me as I can give. As every mother does, when I lay my head down at night and go over the day's checklist, Zeke is the one that I wonder about. 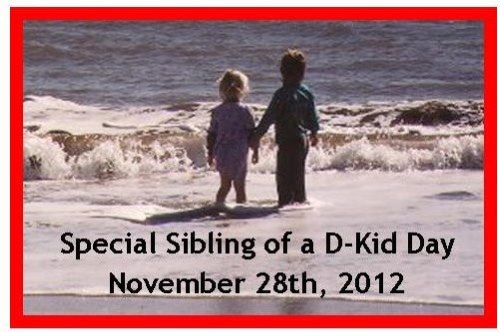 I am banking on the fact that if you are present, loving and there for your kids, they will feel loved. If you tell them they are special, kind, smart, strong and make good choices they will be special, kind, smart, strong and make good choices. I remember Oprah saying that every time you yell at your kids, it changes who they are. So I try not to yell at them. I am hoping that my approach will give Zeke (and Rocco) the necessary basics to go confidently in the direction of their dreams. Whenever I meet a twin or other sibling of someone with diabetes, I always ask, "What is the one thing you wish your mom did better?" They usually say something like "Don't dress us the same" or "Don't askmy brother what his blood sugar is the minute we walk in the door from school". Then I ask, "Did you ever feel like your brother gets all your mom's attention because of his diabetes?" I am happy to say that every sibling will pull his head back and kind of look at me like I have four eyes and say,"Nooo!" Never! 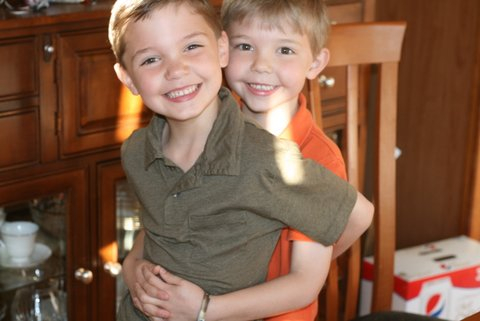 "They also may get a little sad and say that they felt bad that their sibling has diabetes and that their mom does a good job with them both. Based on these reactions, maybe it’s just natural that siblings will accept the situation and just carry on, just like Zeke. I wonder if Zeke will ever feel bad that Rocco got it and he didn't. One time this came up. Zeke said, "Why did Rocco get diabetes and I didn't?" I said, "Because God gave you reflux instead". We all laughed and moved on to fart jokes. For once, I was glad for a fart joke. I am not sure how Zeke will feel in his adult life, I only hope and pray that he will feel as loved as his brother because, of course, he is. Right now, his compassion for his brother's pain is unwavering. The teacher's comment to me the day of their conference was spot on. She said that he loves his brother and when something unusual is happening to Rocco with his diabetes, Zeke gets up from his chair and looks over to ensure that Rocco is okay. It’s nice that someone else sees him the way I do. She said if they were separated into different classes next year, Zeke may feel uneasy that he couldn’t see Rocco to make sure he was good. 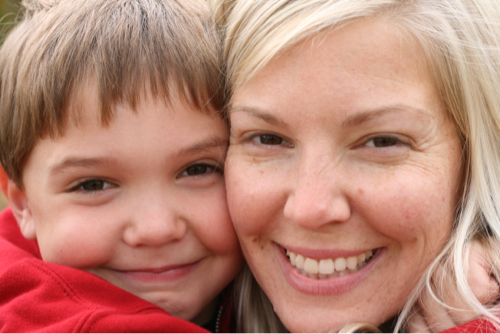 As mothers we try every day to make sure each of our kids feel loved, protected and safe. I think God gave us mother's guilt to help keep us honest. To stay true to raising these little gifts with everything we've got! I know I can always do better for both of them, but I also think that mother’s guilt will make me better for both of them. Mother’s guilt is like a built-in instinct that I can trust. I am counting on it to guide me into loving Zeke just a little deeper every day. So Happy D-kid sibling day Zeke! You deserve an ice cream! Can you please vote for us? And feel free to get your friends to vote as well! There are only two days left! Just click the link and choose everyday highs and lows! Thanks!